Eliran Nargassi is an Israeli menswear designer whose sources of inspiration and aesthetic are a merger between two worlds that, in the minds of most people, should collide. 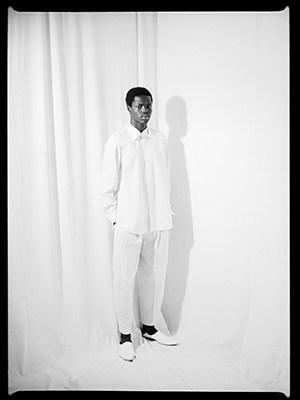 Inspired by his conservative Jewish upbringing, but also by his own sexual liberation journey, Eliran creates garments that are clean, sleek and filled with his emotions. The concept and thought behind the clothes may be controversial, but little by little he is making his way in the Israeli fashion scene, which is a true indicator of the embracing attitudes of the society he lives in. Discover the interview Eliran gave for InCompany by Attire Club, October 2018. Part of what people know about you is that you come from a rather conservative Jewish background, but that you separated yourself from it - mostly because of your sexuality. What can you tell us about that? Eliran Nargassi: I come from a religious Jewish background, but not an extreme one. As a teenager, I felt that it wasn't a way of life that I can feel connected to, perhaps because at that time, the understanding of me being a homosexual was not so clear. I felt like these two worlds are too much of a collision. I can honestly say that today, at age 33, I understand that it is entirely possible to live the way you choose, meaning I can be a fashion designer, both gay and religious. Everything is a matter of a personal choice, and indeed, today I feel much more connected to my sources in a more embracing and inclusive way, and in my own way as well. All of this indirectly translates in the sources of inspiration for the clothes I design. How do you combine today the two? EN: Like I said, I think you can easily combine them as long as you're true to yourself, to whom you choose to be. When I create, I always try to find the harmony between different aspects within my personality. To show that edges can also blend harmoniously. A lot of your inspiration in your designs comes from your personal experiences and from the different facets of your identity. How do you translate your experiences into fashion? EN: Intuitively. The main element I play with in my design is translating the inspiration coming from different facets, their contrasting characteristics, and the graphic shapes of dressmaking pattern. The translation will also be expressed through the use of contrasting textiles and eccentric or monochromatic color schemes. Alternatively, I try to put as much emotion as I can into the design of each garment, by putting much thought and design work in everything down to the smallest of details. How is your approach to clothing received in Israel? EN: Generally, my clothes cannot be regarded as commercial. I get much positive feedback from the Israeli fashion journalism, and from the audience who is familiar with my work. I do understand that my clothes cater to the emotional needs of very specific people, people looking for a unique item, a garment that holds a personal story and to men who are looking for items that are beyond the "fashionable" discussion of seasonal trends. What would you like to see change in your life and in society at large? EN: I'd like to be more socially active for animal rights. The change that I most desire for society and for the world as a whole is a total transition to veganism! Why do you believe many Israeli men are not sartorially inclined? EN: You could say that this is a correct claim. The culture of fashion in Israel is relatively laid back, meaning that convenience comes above all. Not that there is anything wrong with that. But there is definitely a cultural difference between the Israeli man and the classic European man in relation to fashion. My business is largely based online, and it translates to most of my clients being from around the world. I believe that men all over the world will find my designs suitable for them. Who are your clients - how can the wearer of your clothes be described? EN: The man who wears the NARGASSI brand is a man whose aesthetic is a way of life for him. The age range is very wide. He is a customer looking for a unique item with special attention to details. Given that Israel does not have a strong menswear scene, do you think that can change and if so, how? EN: The change is already here, though it is a developing process. Designers who initially did womenswear only are also doing menswear collections today, or collections that are gender neutral, indicating a changing demand in the Israeli man's interest in local fashion. We also see the change in the number of students choosing to design men's or unisex graduate collections in the local fashion schools. You can also see it during Fashion Week in Tel Aviv, which happens once a year, where you can see a growth in fashion shows for men's collections. I believe that just as this movement is also taking place in Europe and that it will gradually trickle into other places as well. What are you currently obsessed with, fashion- and otherwise? EN: I try not to be obsessed in general. Certainly not fashion wise. I can say though that Greek and Arabic music occupy a large part of my daily routine. P.S. We want to hear from you! What do you think of Eliran's designs? What do you make about the Israeli fashion scene? What are you currently obsessed with? Share your feedback, questions or thoughts in the comments below! For more articles on style, fashion tips and cultural insights, you can subscribe to Attire Club via e-mail or follow us on Facebook, Twitter or Instagram!